Bajaj Avenger employs 4-stroke 219.89cc single cylinder engine with oil cooler that has DTS-i technology that gives you maximum power of 19.03 PS and peak torque of 17.5 Nm at 8400 and 7000 rpm which without a doubt proves to be a performance bike. Bajaj Avenger is loaded with amazing features like maintenance free battery which gives tension free reliable starting advantages, attractive foot pegs with rubber damper along with oil check window and engine kill switch. Avenger has 14 litre tank capacity with 3.4 litre for reserve to provide you a nice ride by keeping enough fuel on board. The hydraulic shock absorber on rear and telescopic suspension in the front makes riding smooth and safety. Avenger comes with three mesmerising colors namely black, red and blue with upgraded graphics. Talking about the dimensions of Bajaj Avenger, it weights 154.5 Kg that gives you a perfect control and amazing braking control on roads. With ground clearance of 169mm and wheelbase of 1475 mm Bajaj Avenger gives you enough room for perfect comfortable seats. 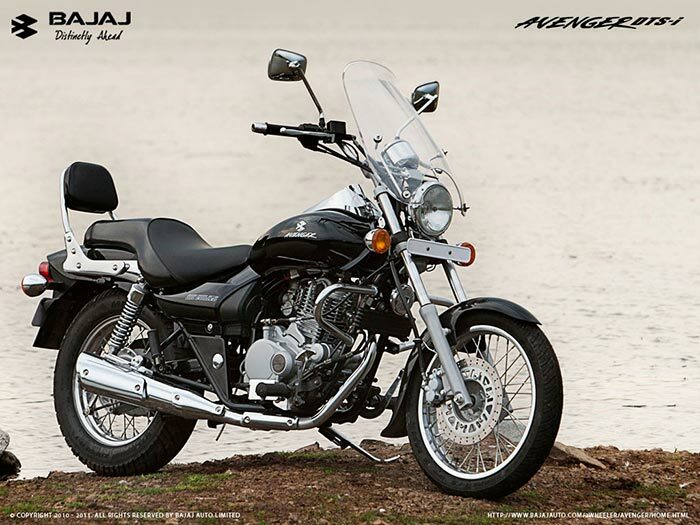 Have you ridden Bajaj Avenger 220? Let us know about your experience by commenting below. Are you looking for Bajaj Avenger 220 Test drive? Comment below.